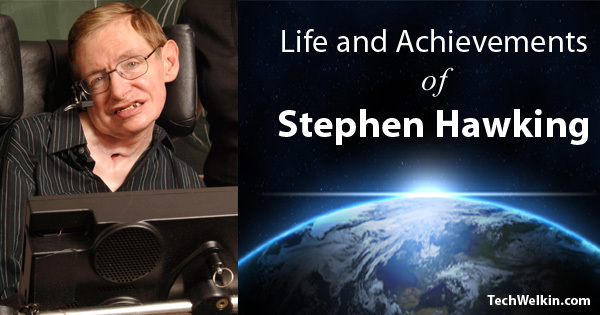 Take a journey through the life and achievements of Prof. Stephen Hawking. His remarkable life and monumental achievements serve as an inspiration. The article is complete with an interesting infographic. NOTE: Infographic about life and achievements of Prof. Stephen Hawking is given at the end of this article. Professor Stephen Hawking is a man of science who tries to understand the mind of God. …these are some questions we normally don’t care to find answers for. We go about our daily lives understanding almost nothing of our world. But not everyone is like that! A few human beings have always been trying to dig out the mysteries of nature. Professor Stephen William Hawking is one of them. This British theoretical physicist, became world famous after publishing his superb work in all-time best selling book called A Brief History of Time. Professor Hawking is considered by many as the most intelligent human being on the earth at present. He was born on 8 January 1942 in Oxford, England. His father was a physician and specialist in tropical diseases; his mother Isabel was active in the Liberal Party. At the age of 11, Stephen went to St. Albans School, and thereafter to the University College, Oxford. Stephen wanted to do mathematics, although his father would have preferred medicine. However, mathematics was not available at the University College —so he did Physics instead. He was awarded a first class honors degree in Natural Science. Stephen then went on to Cambridge to do research in Cosmology. After gaining his Ph.D. he became first a Research Fellow, and later on a Professorial Fellow at Gonville and Caius College. Stephen Hawking is a brilliant and highly productive researcher, and since 1979, he has held the Lucasian Professorship in mathematics at Cambridge, the very chair once held by Isaac Newton. Hawking is already being compared to such great intellects as Newton and Albert Einstein. When Stephen was in his third year at Oxford, he was diagnosed with ALS (also known as Lou Gehrig’s Disease). This disease is a fatal neuromuscular disease that attacks nerve cells and pathways. The disease is progressive, and Stephen Hawking has lived with the disease for 36 years. Up until 1974 (he was diagnosed in 1963), Stephen could not feed himself, get up out of bed, etc. His disease was starting to make life more difficult for Stephen. In 1985, he had a tracheotomy operation as a result of pneumonia. Stephen unfortunately lost his ability to speak altogether following this tracheotomy operation. But fortunately, a computer voice stimulator program called “Equalizer,” was attached to his wheelchair, and he was able to talk and communicate better than before. Soon he was unable to move his hands , and his face muscles. There was nothing doctors could do, and his condition was getting worse. Even though Hawking has this disease, he says that it still did not prevent him from having an attractive family, and being successful in work. Hawking has made his reputation by investigating, in great detail, one particular set of problems: the singularity and horizons around black holes and at the beginning of time. Now, everyone is sure if you encountered a black hole, it would be the last thing you ever encountered–and that is correct! A black hole is a massive system so centrally condensed that the force of gravity prevents everything within it, even light, from escaping. Hawking’s first major work was published with Roger Penrose, a physicist very famous in his own right, and George Ellis, during the period 1968-1970. They demonstrated that every solution to the equations of general relativity guarantees the existence of a singular boundary for space and time in the past. This is now known as the “singularity theorem,” and is a tremendously important finding. Later, working by himself, in 1974, he began to formulate ideas about the quantum evaporation of exploding black holes, the now famous “Hawking radiation.” These are all tremendously important scientific works. In 1984 Stephen worked with James Hartle, a professor at the University of California at Santa Barbara. Using an elegant vacuum fluctuation model, they were able to provide a mathematical rationalization for the entire universe popping into existence at the beginning of time. This is also called the “universe as a wave function.” I need to emphasize that they were using very simple models. Now, while such mathematical exercises are highly speculative, they may eventually lead us to a deeper understanding of this creation event. Stephen’s father was a physician and specialist in tropical diseases and his mother Isabel was active in the Liberal Party. The most important event of his life occurred on December 31, 1962. He met his future wife, Jane Wilde, at a New Year’s Eve party. One month later, he was diagnosed with a terrible disease, ALS, Amyotrophic Lateral Sclerosis. He was given two years to live at that time. They married in July of 1965. Hawking himself has said that “what really made a difference was that I got engaged to a woman named Jane Wilde. This gave me something to live for.” He went on to have three children with Jane, and now has one grandchild. Hawking’s two sons, Tim and Robert, are both not living with him. Tim is in Spain and Robert who got married last year works with Microsoft in Seattle. Stephen’s married life with Jane came to end in 1995 because of some family problems. In 1995, Jane and Stephen got divorced and Stephen married to one of his nurses, Elaine Mason. Elaine was with Hawking, when he recently visited India. At that time Elaine said that she loves her husband , from the core of the heart. A normal day for Hawking begins at 6 am with The Guardian and a cup of tea. This is followed by his wife cooking him some breakfast, usually sausages, bacon and eggs. He then leaves for college, driven by his nurse where he looks into departmental matters as head of General Relativity, or supervises his three PhD students and by 7 pm he is done for the day. Back home, it’s time for dinner, which is either home cooked, a take away or a drive to a restaurant. Finally, Stephen checks mail. Classical music is what keeps him entertained, Mozart, Wagner and Mahler his favorites. Stephen with his wife frequents concerts. Though he enjoys movies as well. Hawking who is a lover of hot, spicy food is slave to Indian curries and the like. Back in Cambridge the man often eats at Indian restaurants, when not indulging in his other favorites Thai curry and steaks. Eating out apart, he always attends the college dinner a weekly affair, a formal sit down meal. Though hard foods are not on his menu he freaks out on ice creams, fruits and has unlimited cups of tea. Favorite brews? As any true Brit tea is tea though Darjeeling figures high in the priority charts. A Brief History of Time was first published in 1988, and has since sold millions of copies in many languages. Hawking wrote the book because he wanted to make some financial provision for his family. It has sold in excess of 15 million copies. For a book to sell so many copies is almost unheard of in the history of science writing. In this book Professor explains the mysteries of the universe in a way that even a nonspecialist in physics can understand. Also, in this book, he very much talks about God also. Professor explicitly says that he tries to understand the mind of God. Why “God” created the universe and what is the future of it? Hawking is certainly the most famous physicist in history who has not won the Nobel Prize. This has puzzled people. They automatically assume he has won the Nobel Prize. He has not yet. This is because the Swedish Royal Academy demands that an award-winning discovery must be supported by verifiable experimental or observational evidence. Hawking’s work, to date, remains unproved. The mathematics of his theory, however, are certainly beautiful and elegant. Science is just beginning to verify the existence of black holes, let alone verify “Hawking radiation” or any of his more radical theoretical proposals. Isn’t Stephen Hawking’s life a remarkable one? I am eagerly waiting for the day when he will be awarded the Nobel Prize. He is not only a brilliant scientist, he is also a great inspiration for people with disabilities. His struggle and success inspire millions. Salute to the Professor! Life of Stephen Hawking is really inspiring. Amazing article! It is prodigious. Thank you very much sir, for your valuable information and service to mankind. May be the best article written on this man. Some links to wikipedia (such as Halking Radiation etc.) may make the article more interesting for readers like me. This one is the best article I read here.